Sculpture of welded metal with fused colored glass and monoprints by Paul Yank who has been working in his Cedarburg Brewery Works Complex studio space since 1966. 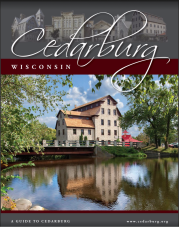 Cedarburg Art Museum, W63 N675 Washington Avenue. Museum hours are Wed.-Sat., 10am-4pm, Sunday, 12-4pm.